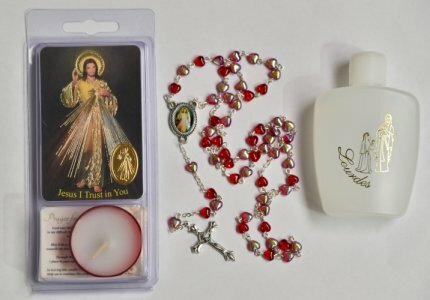 CATHOLIC GIFT SHOP LTD - Divine Mercy Rosary Gift Set. Divine Mercy Rosary Gift Set. > Divine Mercy votive candle & laminated prayer card with gold foil medal, to Sacred Heart of Jesus.Candle burns for 2 hours. Size: 2 1/4" x 6 "
> Lourdes holy water bottle, measures 8.5 cm tall. > Divine Mercy red heart shaped rosary beads. Glass heart beads measure 5 mm, Rosary measures 18 inches approx.